Jurgen Logemann at BCR Logemann sends news of a new addition to the company's charter listings as the 28.7m sailing yacht Sea Shuttle joins the fleet. 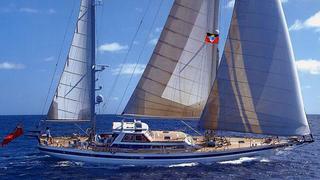 She is a classic ketch built by Jongert in 1983 to a design by De Vries Lentsch. She has had the same owner since new and has been meticulously maintained and upgraded, including a comprehensive refit in 2008. MCA compliant, this superyacht sleeps up to seven guests in a master suite, two twin cabins and a Pullman berth. Sea Shuttle is available for charter in the South of France this September at rates starting from €23,000 per week under MYBA terms.